Recently delivered Bluetooth-connected devices are expected to reduce hospital visits. Consumers and health care providers using home health monitoring services through Centura Health will find the experience easier and more beneficial than ever thanks to new devices the organization recently delivered to patients. Centura Health has long been the region’s pioneer in home health monitoring. Using devices such as scales and blood pressure cuffs connected to telecom devices, patients with chronic conditions take their own measurements and transmit them to a nurse. This technique is widely credited with reducing hospital admissions and emergency visits, and it’s one of many ways the organization optimizes health care value for consumers. 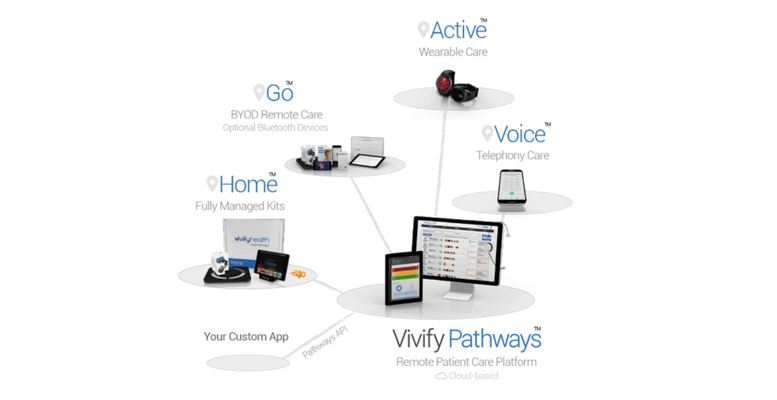 The new hardware, from Vivify Health of Plano, Texas, adds pre-recorded instructions in multiple languages, Bluetooth connectivity of medical device peripherals, and the ability to video-chat with a nurse via an “instant on” 4G tablet. “Biometric data alone has been proven to increase quality of life, but there’s room for subjectivity when the nurse has to ask a patient by phone if, for example, an ankle became more swollen overnight. Now the nurse can see the ankle and determine if an in-person exam is necessary,” said Samantha Lippolis, telehealth director, Centura Health. “A ‘bring your own device’ option is available for patients with lower acuity and a higher comfort level with technology,” Lippolis said. The new devices will be made available at first to about 100 patients who are enrolled in Colorado Accountable Care, a Medicare Shared Savings Plan administered by Centura Health, or who receive services from Centura Health at Home, the organization’s home health agency. “We are honored to be a part of Centura Health’s vanguard vision to improve the health of patients with all conditions, including chronic illnesses, with proactive care and interventions,” said Eric Rock, CEO of Vivify Health.